#6 in The Best Sports Movies ever made. The first and the best! 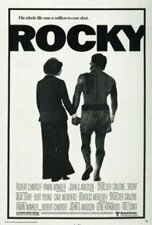 Writer/star Sylvester Stallone is the Philadelphia pug boxer who gets a dream shot at fighting the heavyweight champion in this rousing drama that struck a chord with audiences around the world, made Sly a superstar, and won three Academy Awards, including Best Picture. With Talia Shire, Burt Young, Burgess Meredith, Carl Weathers. 120 min. Widescreen (Enhanced); Soundtracks: English Dolby Digital 5.1, French Dolby Digital Surround, Spanish Dolby Digital Surround; Subtitles: French, Spanish; audio commentary by Stallone; deleted scenes; interviews; featurettes. Two-disc set. It's the rematch of the century, as Philly's own Rocky Balboa (Sylvester Stallone) steps back into the ring to challenge champ Apollo Creed (Carl Weathers)...and invalidate the theme of the first film. Talia Shire, Burgess Meredith, Burt Young also star. 119 min. Widescreen (Enhanced); Soundtracks: English Dolby Digital 5.1, Spanish Dolby Digital mono, French Dolby Digital mono; Subtitles: English, Spanish, French. He's now the heavyweight champ, but Sylvester Stallone finds a dangerous adversary gunning for his title, in the mohawked form of brutal club boxer Mr. T, in the third knockout drama. With Talia Shire, Carl Weathers, Burgess Meredith, and Hulk Hogan as Thunderlips. 100 min. Standard and Widescreen (Enhanced); Soundtracks: English Dolby Digital 5.1, Spanish Dolby Digital mono, French Dolby Digital mono; Subtitles: English, Spanish, French. "Yo, Ivan!" Stallone is back as heavyweight champ Rocky Balboa, here squaring off against Soviet boxer Drago, an unstoppable fighting machine who has already killed one man in the ring. All this, and a plea for global understanding, too. With Talia Shire, Burt Young, Carl Weathers and Dolph Lundgren. 91 min. Standard and Widescreen (Enhanced); Soundtracks: English Dolby Digital 5.1, Spanish Dolby Digital mono, French Dolby Digital mono; Subtitles: English, Spanish, French. The last (or is it?) entry in the ever-popular series finds Sylvester Stallone's Rocky down-and-out-of-moolah in Philadelphia. He takes a talented, young boxer under his wing, but the fighter signs with a sleazy promoter. Rocky laces on the gloves again, but does he have the stuff to clobber his powerful, deceitful opponent? Talia Shire, Tommy Morrison and Sage Stallone co-star. 111 min. Standard and Widescreen (Enhanced); Soundtracks: English Dolby Digital 5.1, Spanish Dolby Digital mono, French Dolby Digital stereo Surround; Subtitles: English, Spanish, French. Sylvester Stallone wrote, directed and (of course) stars in the sixth film in the beloved franchise. In the wake of Adrian's death, the once-great Rocky agrees to an exhibition bout with current heavyweight champ Mason "The Line" Dixon (Antonio Tarver), who wants to fight the living legend to earn some respect. Will stepping into the ring one last time give Rocky's life the meaning it's been missing? With Burt Young, Geraldine Hughes, Milo Ventimiglia. 102 min. Widescreen (Enhanced); Soundtracks: English Dolby Digital 5.1, French Dolby Digital 5.1; Subtitles: English, Spanish, French; deleted scenes; alternate ending; "making of" documentary; audio commentary; more. Six-disc boxed set includes "Rocky," "Rocky II," "Rocky III," "Rocky IV," "Rocky V," and "Rocky Balboa." Return from #6 on the list of Best Sports movies to the Top 100 of all time. Return from #6 on the list of Best Sports movies to the Best Sports Movies homepage.